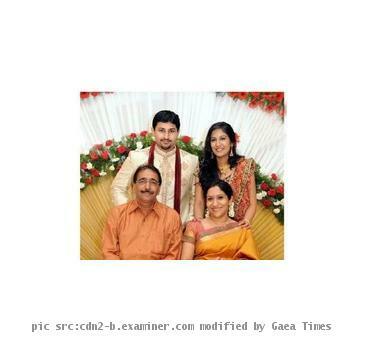 TRIVANDRUM, INDIA (GaeaTimes.com)- The wedding bells have rung for the popular South Indian singer, Swetha Mohan. The melodious lady got married to her long time boyfriend, Ashwin, in a simple homely and traditional wedding on Sunday, January 16. The 24 year old looked stunning in her traditional red and golden lehenga choli, during the marriage ceremony. She is the daughter of veteran singer Sujatha Mohan. Swetha Mohan and her husband got engaged last year, and since then there has been speculations that she would be shifting to USA, where the groom resides. However, Ashwin, who is also a very passionate music lover has said that he does not want his wife to give up music, and he would always support her in pursuing a brighter music career. Dressed in a golden and red lehenga, like every traditional South Indian girl, Swetha Mohan hanged a white garland of flowers in her head. With not too much make up or over the top jewelery, she looked more stunning than ever. The wedding was attended by several celebrities, like singer Yesudas, famous music director V Dakshinamurthy and M A Baby, the culture affair minister of Kerala. Before her wedding, Swetha Mohan has delivered some of the biggest South Indian hits. She has sung in not only her mother tongue Malayalam, but also in Telegu, Tamil and Kannada. She debuted with the song “Achcham Achcham Illai”, that became a cult hit in South India, right from the moment it was released. Later on she has also been the proud recipient of Kerala State Award, Filmfare Awards Malayalam, Film Critics Award and Sunfeast Isai Aruvi Award. Recently, she even lent her voice for Rajnikath’s latest hit, “Enthiran”.